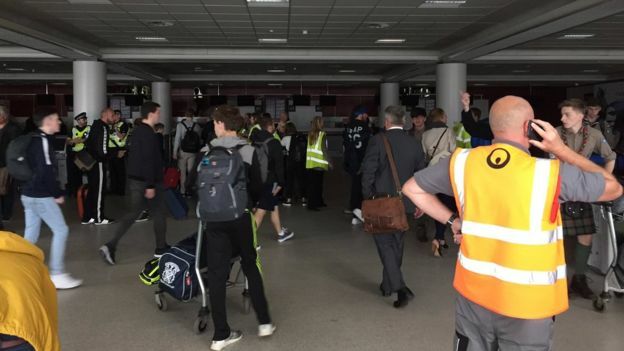 Flights and terminal services at Edinburgh Airport have been disrupted by a power cut. It is understood the electricity failed just before 09:00. The airport said the power "was now returning" but flights have been disrupted and passengers should expect further delays. The power cut affected the terminal building and the main hall was plunged into darkness with only emergency lighting available for almost an hour. It was not possible to provide the usual ground services such as check-in or security during the outage. Long queues have formed outside the terminal building. Authorities said they are dealing with a backlog of passengers who have been unable to check-in for an hour-and-a-half. The airport said that back-up power systems also failed inside the terminal, but not on the airfields, which is why runway lights remained on. It is still not known what caused the power failure. The airport said planes are still landing and taking off. Some passengers who landed were unable to leave planes because immigration facilities were down. They are now being let off gradually. Officials have started taking passengers through security in batches but queues are still growing. 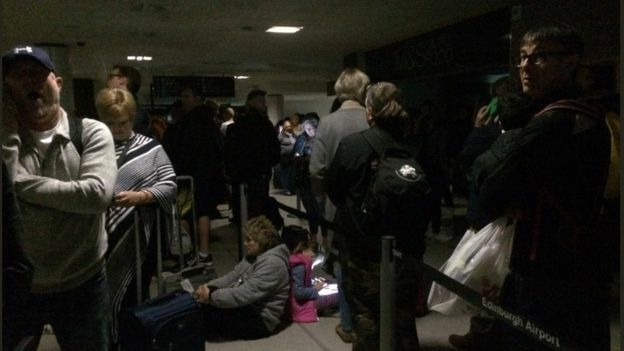 An airport spokesman said: "We can confirm that power is now returning to the terminal and that flights have resumed. "We're working to allow passengers to continue their journeys in a safe and ordered manner and we thank passengers for their patience whilst we do this. "As always, the safety of passengers and staff is our priority. We expect there to be further delays whilst we clear the backlog."